Cantaloupe is a delicious, summery fruit that is loved all over the world. Like most natural whole foods, it is full of benefits for your health and wellbeing. There is an excellent reason why this fruit is popular from Asia to the United States. With a sweet flavor and smooth texture, it is appealing to people of all ages. 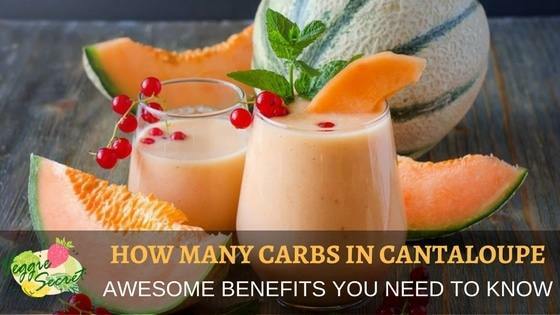 Read on if you’re curious about how many carbs in cantaloupe there are, what are the other benefits, and what is the best way to eat. 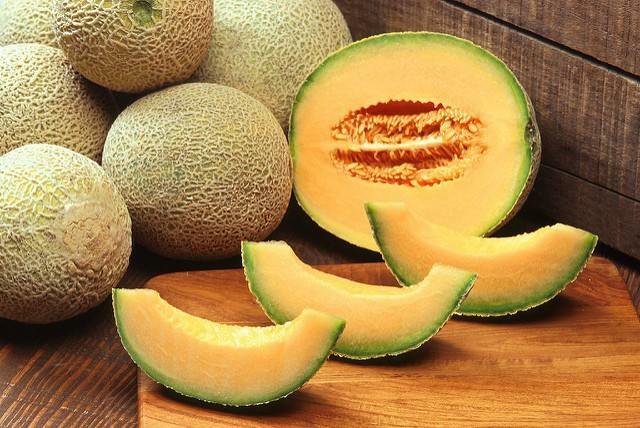 Cantaloupe is a member of the melon family of fruits. It is closely related to watermelon and honeydew melon. If you are from Australia, you might call this fruit a rockmelon. Let’s go over the nutritional aspects of this delicious fruit. One cup of cantaloupe has only 60 calories, making it a very low-calorie snack! Those 60 calories have no fat, 1 gram of protein and 16 grams of carbs. Of those carbs, 2 grams are fiber, and 14 grams are sugars. So if you’re wondering how many carbs in cantaloupe there are, now you know that there are 16. In terms of micronutrients, cantaloupe is a powerhouse. 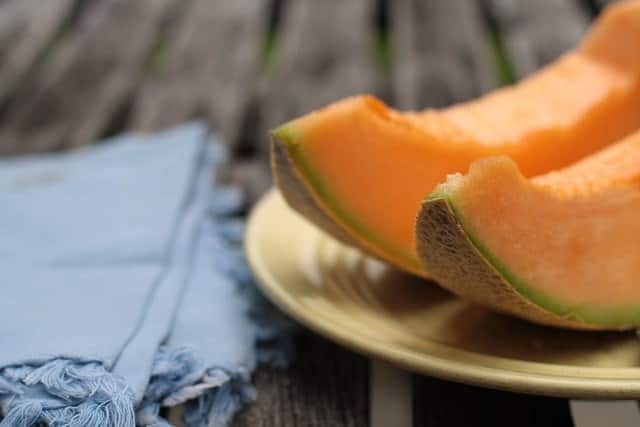 One cup has 120% of your daily needs for Vitamin A and 108% of your needs for Vitamin C. On top of that, cantaloupe is also a good source of potassium, folate, copper, Vitamins B3, B1 and B6, magnesium, calcium, iron, and vitamin K! 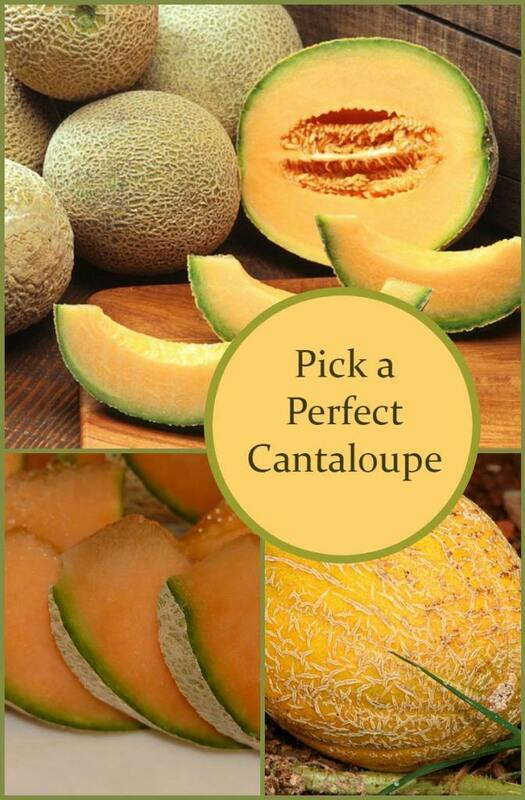 There are so many reasons to be eating cantaloupe! Because cantaloupe is low calorie, fat-free, and full of micronutrients, it makes sense that it would have some huge benefits for your health. Let's go over the three best reasons to include more cantaloupe in your diet. The nutrients found in cantaloupe can help to lower inflammation throughout your body. Inflammation is the body’s natural response to problems and injury. A small amount of inflammation in the body is a good thing, but when there is too much or chronic inflammation, it can lead to serious health problems. 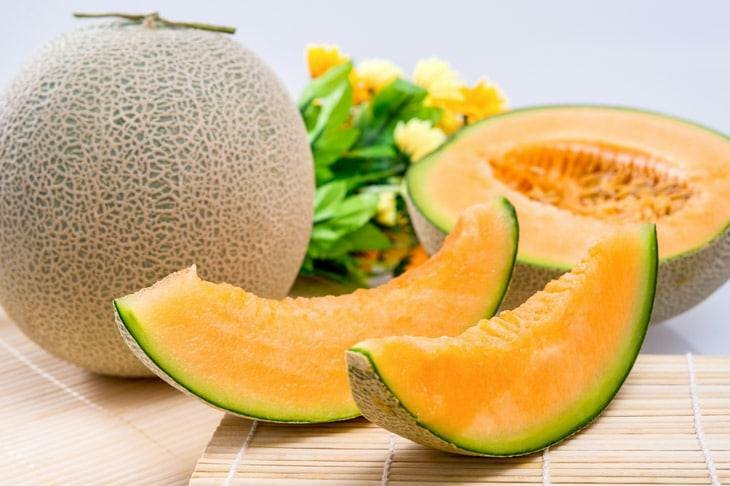 The high nutrient content of cantaloupe helps to lower the risk of metabolic syndrome in the body. Metabolic syndrome is a name used to describe a group of health problems such as high blood pressure, high blood sugars, high blood fats, and having too much body fat overall. These problems may be caused by living an unhealthy lifestyle. If you are inactive, have a bad diet, or are very overweight, you may be at risk for metabolic syndrome. The problems that are a part of metabolic syndrome can result in chronic unhealthy inflammation and oxidative stress throughout the body. Oxidative stress, in turn, can lead to the growth of cancer cells. Luckily, the nutrients in cantaloupe can help combat these negative effects. Cantaloupe provides a wide range of antioxidants. 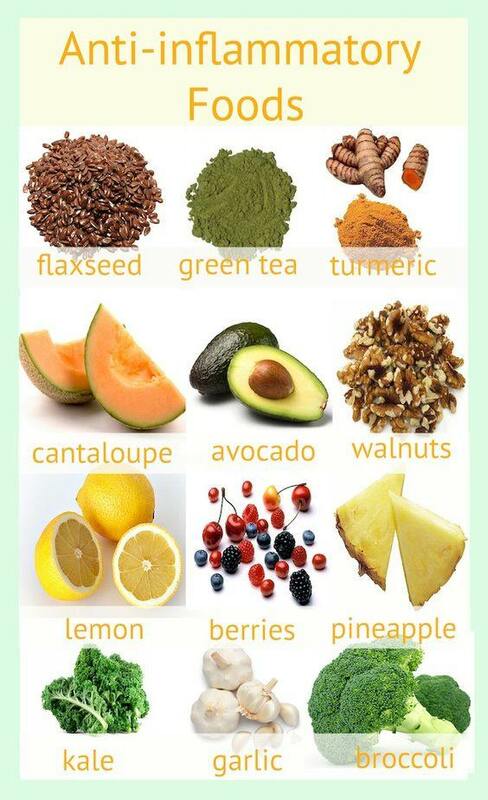 These antioxidants enter the body and help to fight off and reduce oxidative stress and inflammation. Studies have also shown that people who consume more cantaloupe have lower levels of C-reactive protein in their blood. C-reactive protein is an indicator of high levels of inflammation in the body. So it makes sense that when we eat more, we lower our levels of inflammation! Because cantaloupe is a fruit with a very high water content, along with its many vitamins and minerals, it is a great food to eat for better skin. The vitamin A helps to minimize the outer layer of skin cells which block pores and cause breakouts. Also, the vitamins and minerals found in cantaloupe can help prevent wrinkles. Along with its vitamin content, cantaloupe also provides a lot of water and electrolytes in each serving. The water helps to hydrate the skin, keeping it fresh and youthful. For better skin, try to eat at least one serving of cantaloupe everyday! The best overall health benefit of eating cantaloupe is its incredible diversity of nutrients. When people think of popular healthy fruits, the first fruits that come to mind are berries. Blueberries, strawberries, and raspberries are widely recognized for their high levels of antioxidants. However, cantaloupe has the same amount of nutrients as blueberries and even more nutrients than strawberries or raspberries. Also, because cantaloupe is so low in calories, it is easy and safe to eat multiple servings of this fruit each day, increasing our overall nutrient intake.Add some cantaloupe to your diet today. There are five tricks to buying fresh cantaloupe when you are in the grocery store. To buy a ripe cantaloupe, make sure you try one of these steps. Pick up the cantaloupe, it should feel heavier than you expect. Tap on the cantaloupe and listen to the sound. It should sound dull and full, not hard and hollow. Press gently on the stem end. It should give a little when you push on it. If it doesn’t move at all, the cantaloupe is not ripe. If you are able to push it in a lot, the cantaloupe is probably overripe and won’t be very delicious. Look at the color of the rind. Underneath the white mesh that covers the plant, the rind should be white or yellow. If the rind is still green, that means it is probably not yet ripe. There are a few ways to prepare and enjoy cantaloupe. The first step is always to wash the outside of the fruit thoroughly. You need to wash the fruit in order to remove any unhealthy bacteria that may infect the fruit and make you sick. Cut the fruit in half and scoop out the seeds. You can save the seeds for roasting, as they are also edible. Once you have scooped out the seeds, cut the halves into slices, and remove the rind. Now cut the cantaloupe flesh into chunks. Try serving the cantaloupe as part of a fruit salad with honeydew melon, watermelon, and some fresh berries. Or you can blend cantaloupe and peaches together in a blender for a summery smoothie. Cantaloupe also tastes great served with some tangy Greek yogurt! However you like to eat it, there is no doubt that cantaloupe is a great food to eat for better health. With more than 10 powerful vitamins and minerals in every serving, this fruit can help fight off inflammation, improve your skin, and boost your overall health and wellbeing.